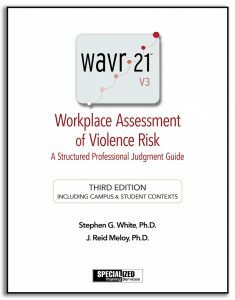 Violence risk is complex but comprehensible. WTS’s approach to organizational threat assessment and case management is to recognize clients’ strengths, reinforce existing or developing internal resources, and augment them with our expertise when indicated. Risk scenarios vary widely in their seriousness, potential outcomes, and impact on an organization and its members. The experience and expertise of internal case managers – in human resources, security, legal, mental health, judicial affairs, and campus police departments – vary widely. Each discipline brings its own professional perspective to the matter at hand. Those new to this experience are prudent to rely significantly on expert advice offered to decision makers. Large organizations with well-trained teams and a steady volume of cases of concern can become efficient and effective responders to risk scenarios. WTS’s expertise is particularly valuable in cases involving manifestations of mental illness, complex personality or character issues, and when the level of risk or concern otherwise appears to be high. There are many nuances in individual cases. Opinions of risk and subsequent tactical decisions can have a significant influence on the course and outcome of a particular situation. Because of our many years of experience we have seen and consulted on a wide range of risk scenarios. The ongoing issues are to identify the signs of a rare but catastrophic event, such as a predatory act of mass murder, to not over-react or injudiciously to the large number of low or no risk situations, and to be aware of the many varieties of potential situations that may be encountered in organizational life. WTS works collaboratively and respectfully with threat management teams to address these needs in the interest of maintaining safe, comfortable, and fair-minded workplace and academic communities.